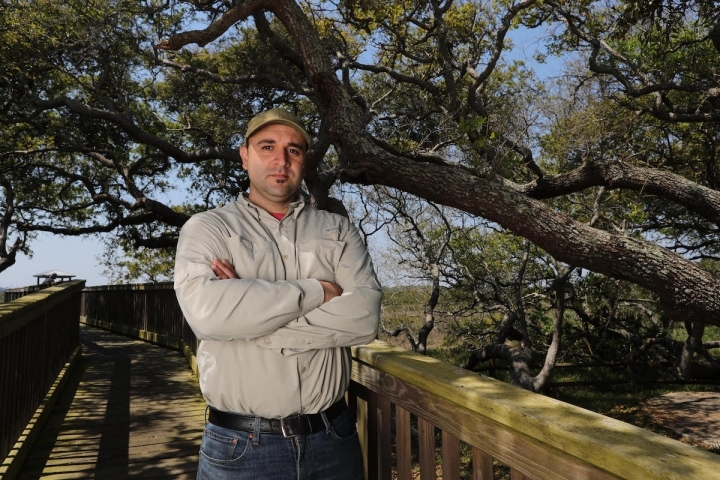 ST. AUGUSTINE, FLA. — Walking along a wooden path winding through Nease Beachfront Park, Danny Lippi pointed to coastal trees sprouting from the shrubbery around him. The exotic species were brought here by warming temperatures — bringing business opportunities for the local arborist. Demand for Danny Lippi’s mangrove trimming service is growing as climate change pushes more of the trees north. Demand for Lippi’s mangrove trimming service has been growing as the trees have been accumulating northward, starting to block coastal views from Ormond Beach to Palm Coast. Their northernmost limit in the U.S. sits about 70 miles from St. Augustine on Amelia Island, and it continues to shift. This coverage was produced through partnerships with WJCT, the public media organization in Jacksonville, The Florida Times-Union, and PBS NewsHour. Smithsonian Environmental Research Center research shows mangrove coverage has doubled along Northeast Florida’s coast since 1984. This freshly arrived abundance of mangroves may block waterfront views and squeeze out marsh wildlife, but the tropical trees’ value is celebrated by the state. 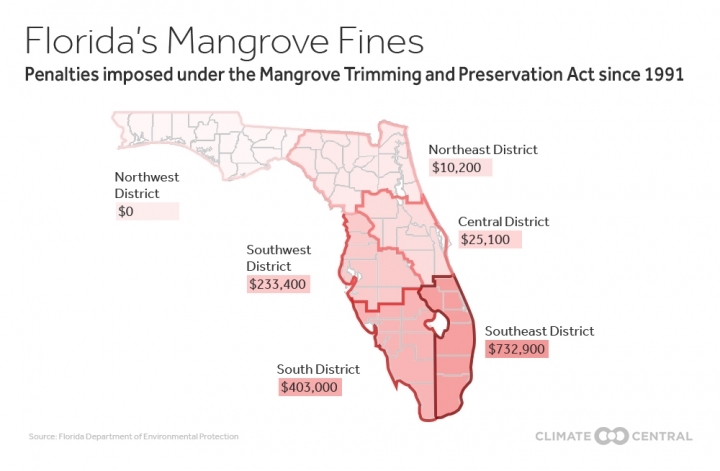 Florida legislators regard the trees as storm buffers and coastal habitat, and the Mangrove Preservation and Trimming Act safeguards mangroves and forbids their trimming by anyone lacking arborist certification. More than 500 violations have been issued since the legislation passed in 1995, with some businesses and residents hit with fines of tens of thousands of dollars each. On average, researchers have estimated mangroves protect $13 billion worth of property in the U.S. annually from storm and flood damage. The range expansion also carries implications for global climate change. As the trees have spread along the Atlantic coast, new research in the journal Hydrobiologia shows blue carbon, or carbon captured in coastal ecosystems, in the soil beneath them increased by two-thirds over three years — slowing climate change by keeping carbon out of the atmosphere. Using satellite imagery, Feller and another set of researchers found that a reduction in freezing weather caused mangrove forests to expand by more than 1,720 acres along Northeast Florida’s coast — points north of Daytona Beach — between 1984 and 2011. Nearly three years ago, demand for Lippi’s mangrove trimming services spiked. Now it makes up about 15 percent of his business — and the dynamic with these customers tends to be different. “They’re being forced to hire me,” the arborist said. With marshland giving way to mangrove forests, Lippi also said effects on waterfront views are capturing the attention of St. Augustine’s locals. A fourth-generation fisherman, charter boat captain Zach Timmons has navigated the Old City’s waterways since he was a child. Timmons has watched mangroves advance into areas like downtown St. Augustine, even spotting some farther north. Shifts in mangroves’ growing ranges from the tropics toward the poles are affecting ecosystems and fisheries worldwide, replacing salt marshes from Australia to Louisiana and Florida. With this expansion, some marsh plants and the animals that rely on them get pushed out of their habitats. While Timmons said he hasn’t noticed their affecting local fishing yet, he’s prepared for changes ahead. Fish, shrimp, crabs, birds — everything that lives along the coastline — are forced to adjust as mangroves make new homes in former salt marsh territory. Three mangrove species are found in Florida: red (rhizophora mangle), black (avicennia germinans) and white (laguncularia racemosa). With atmospheric levels of heat-trapping carbon breaking records yearly, governments and environmentalists have been ramping up efforts to conserve huge natural carbon deposits, such as those found in forests and wetlands. Scientists have discovered that a hectare of mangroves can bury up to four times more carbon than a hectare of rainforest. Yet upwards of a third of the world’s mangrove forests have been wiped out worldwide, mostly by coastal development and invasive species. The United Nations Environment Program reported in 2014 that mangroves are being cleared up to five times faster than other forests. As historical mangrove forests in Florida and elsewhere are protected and restored, UCLA Assistant Professor Kyle Cavanaugh has been studying the poleward expansion of their ranges worldwide. Using remote sensing and spatial data, he has led projects monitoring changes in mangrove abundance along the East Coast. Linda Mulay lives on the fifth floor of a Port Orange condominium complex overlooking the waterfront. From her balcony, she can see a cluster of entangled mangroves sprawled over a seawall that was constructed to shelter the building. Research examining sites in Florida and New Zealand published last month concluded that if stands of mangrove are wide and dense enough, they can provide effective flood protection during storms. In central Florida, where Mulay lives, mangroves have been a fixture of the environment for as long as she can remember. Mangroves in the Matanzas River north of St. Augustine. Like a small troop of soldiers taking up arms against a colossal battalion, the mangrove stand “likely prevented water damage” from both hurricanes by “reducing storm waves and preventing future coastal erosion,” said University of Waikato PhD candidate John Montgomery, lead author of the study published in the journal Geophysical Research Letters. As pollution from fossil fuel burning and other industrial activities continue to bump up temperatures, storm surges are becoming more of a threat along Florida’s coastlines. Climate change intensifies storms and raises sea levels, both of which exacerbate flooding. Research by Feller and others has shown these ecosystems can keep pace with rising sea levels by trapping and producing soil and other sediment and raising the height of the coastline. 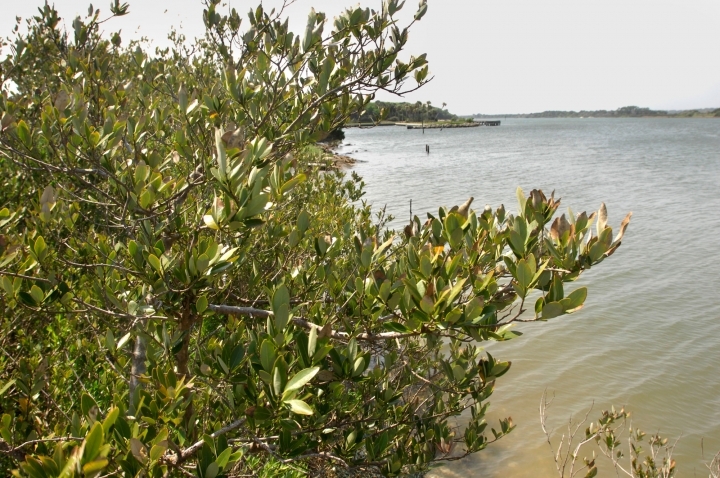 Ongoing research at the Guana Tolomato Matanzas Research Reserve is investigating how mangroves taking root there might help the coastline adapt to future sea levels. Michael Beck has been analyzing the economic role mangroves play in flood risk reduction. A research professor at the University of California Santa Cruz, Beck spent the past decade investigating how wetlands could be used to improve the ability of coastal communities to “bounce back” after floods and other disasters. Beck is partnering with FEMA and the insurance industry to identify flood risk benefits and new ways to fund the conservation and preservation of mangroves. His past research concluded that mangroves reduce global flood damage by $82 billion a year — including $13 billion in the U.S.
A senior marine scientist for the Nature Conservancy in Florida, Laura Geselbracht specializes in coastal restoration and conservation science. Based out of Coral Gables, the nonprofit manages more than 55,000 acres of land across the state and is running a Miami-Dade project where wetlands are being used to protect homes and communities. Hayes is working with Samantha Chapman, an associate professor of biology at Villanova University, on experiments at Guana Tolomato Matanzas Research Reserve simulating potential future temperatures to assess how mangroves will respond to the effects of climate change. Emissions of heat-trapping pollution by the U.S. and the world increased last year, even as cities like St. Augustine searched for ways to adapt to climate change’s impacts, including the worsening of flooding, storms and heat waves. Chapman thinks warming could push the uppermost range of mangroves into Georgia within a decade. Pointing to evidence that “hurricanes push mangroves northward,” she said recent storms mean individual mangroves may already be taking root even further north on Florida’s coastline.